Sarah Chadburn ist Post-Doc an der University of Exeter. 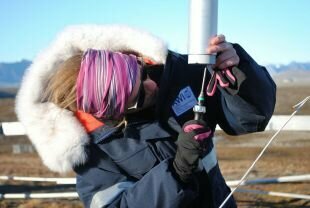 Sie arbeitet an der Modellierung von Permafrost und hatte die Möglichkeit die Gruppe von Julia Boike für die jährliche Instandsetzung der Bayelva Permafrost Station in Ny-Ålesund zu begleiten. So konnte Sarah einmal vor Ort zu sehen, wie denn so eine Permafrost Station aussieht, was ihr bei der Entwicklung des Computermodels von Nutzen sein könnte. 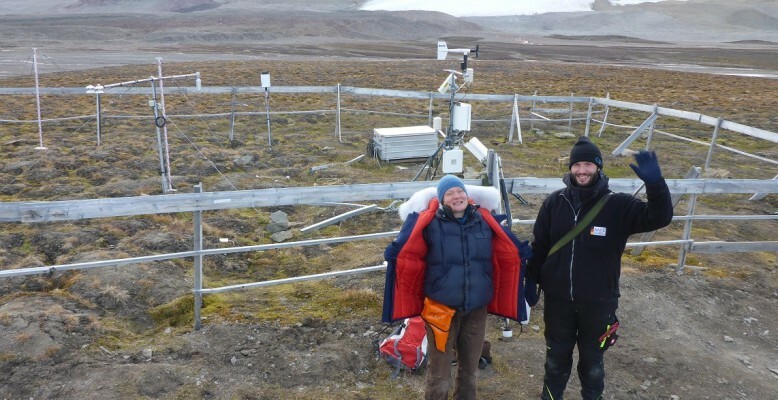 Ihre Erlebnisse hier in Ny-Ålesund schildert sie in einem Blog von Page21 – Changing Permafrost in the Arctic and it’s global effects in the 21th century und hat auch für uns hier einen Beitrag geschrieben. Viel Spaß beim Lesen. I was very lucky to join Julia Boike’s expedition to the AWIPEV station this year. 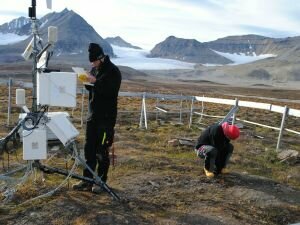 We’ve spent a week here, working mainly at the nearby Bayelva field site, where the group from AWI Potsdam has been taking measurements of the permafrost for 17 years. There were four in our little group, Julia who leads the group and has been up here many times before, and Stephan, Niko and me. Niko is an engineer in Julia’s group and he’s spent a lot of time in the Arctic, but never in Svalbard until now. Stephan is also an engineer but he has not much experience in the Arctic. And finally I am a computer modeller from the University of Exeter in the UK, and I have no experience outside of my office – until now! The Bayelva site is situated in the catchment of the Bayelva river which is a meltwater river from the glacier above it. The site itself sits on a small hill with some interesting permafrost features of patterned ground. On Thursday, Julia and I changed the radiation sensors, although when we got back we discovered one of them wasn’t working, so this required a return visit to fix the wiring. There were also problems with the temperature chain for Mr Moustache, but everything seems to be working now, so the story of our work at Bayelva is one of success. Another job that needed doing was taking soil samples. We wanted to go out on a boat and take samples from a nice area down the end of peninsula, but sadly the waves were not on our side, so in the end we didn’t manage the boat trip but we took some similar soil samples right next to the village. 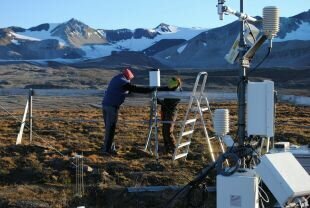 This was both my first field expedition and my first time in Svalbard. It has been a fantastic experience. Arriving in Svalbard was amazing in itself – I couldn’t believe I was really here. We loved the flight in the little plane to Ny Alesund, getting such great views of the glaciers and mountains from the air. Certainly there were no hardships of being ‚in the field‘, since the station at Ny Alesund is so cozy and well-equipped, and we got a tasty and plentiful meal at least twice a day. We also enjoyed visiting the shop, the bar, and sending ‚telegrams‘ to our friends. As well as work, we went on two hikes while we were here, and they were both brilliant. On our first night in Ny-Alesund we hiked along the beach with René and one of the huskies. The evening sun was casting a beautiful light along the fjord and the moon was rising above the mountains and glaciers in the background. There were also some amazing icebergs along the shore. Our second hike took us up to the foot of the glacier above the Bayelva field site, which was awesome to see, and then we climbed part of the way up one of the mountains to get a great view over the surroundings. It’s moving towards winter here, so we’ve been pretty cold, but that feels like the authentic Arctic experience. I am so impressed by the people who live here, especially getting through the dark winter months. But they say they it is beautiful in the winter too, and they seem happy. In a way, I am not surprised, living in such a beautiful place, with nice people around, close to nature and far from the crowds of cities and the pressures of ’normal‘ life. I hope one day I will come back here. Niko working. Stephan ‚helping him‘.